With our range of machines we are capable of tackling pretty much any size stump in most locations. To access a tree stump, all we need is an access point of approximately 3 foot (standard gate width) for the large machine to get through. Where access is restricted and narrower than 3 foot, we will use one of our smaller, more compact pedestrian stump grinding machines. 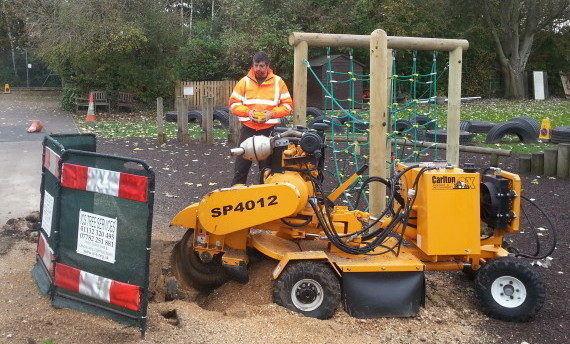 This combination of machinery allows us to access virtually any tree stump requiring removal. All our stump grinder operatives are fully trained in the correct use of these powerful machines and have many hours of experience in their use. All our staff are trained and tested to NPTC standards (National Proficiency Test Council) part of City and Guilds, so you can be confident you are employing professional, qualified operatives. What do we do after the stump is removed? When we have finished grinding the stump, we fill the hole and level the area. The location can then be used immediately for either planting or re-turfing etc. Any excess spoil (sawdust) can be either put on your garden’s borders or we will remove it from site entirely if required. The quickest way of getting a quote for tree stump removal is to either text or email some pictures to us along with a rough measurement of the stumps diameter at its largest point. We can then give you an estimate of the price over the phone. For a complete tree surgery service in Leeds contact us.